This is a fabulous little piece, highly instructive and visually informative. Many thanks to the CSNTM and Peter Montoro, and of course, Dirk Jongkind. The accents were not written in the earliest copies, as any papyrologist will confirm. These wrong accents that start appearing in late manuscripts have no authority whatsoever. I think a helpful analogy could be drawn to the vowel pointing of the MT. Though the vowel points were not originally written, the language had the vowels that the later vowel points represent from the very beginning. The work of the Masoretic Scribes may not have been perfect but they knew a whole lot more about what they were doing than we would have been able to figure out without their help. I for one am thankful to have a pointed text of the OT. The scribes who copied the manuscripts of the NT may have done so several centuries after the manuscripts were originally written—but they were still several centuries closer than we are. Furthermore many, though of course not all, of them knew the language vastly better than any scholar living today. Perhaps we should pay attention to the work that they did. We may find some mistakes and discrepancies of course—but that is not the same thing as ignoring them altogether. The ancient system of accentuation (including the treatment of enclitics) is known from ancient grammarians. There is no reason to accept the accents introduced in late copies by error-prone Byzantine copyists. See e.g. West, Textual Criticism and Editorial Technique 54-55. In fairness I would want to point out that modern editors are not immune to error either. And I doubt there are many scholars living who have a sense for the flow of the sounds of the language that is anywhere close to being as good as those "error-prone" Byzantine scribes. Furthermore there was a major shift in pronunciation, including the function of the accents, during the Hellenistic period—the majority of the classical texts lie on the opposite side of that divide from the New Testament, which means that the scribal tradition is much more likely to be accurate for the New Testament than for the classical texts that West is referring to. Finally, as Larry Hurtado, Harry Gamble, and others have recently demonstrated there was, from the earliest extant evidence, vastly more care given to the production of copies of the NT that were suitable for public reading than to any other text that we know about and this care clearly extended into Byzantine times. None of this is to say that the accents in manuscripts will always be correct or that the scribes were infallible as they clearly were not. The questions Dr. Robinson poses below are valid and will need to be answered as will many others I am sure. At the same time, to treat the evidence of scribes who, at least in the Byzantine context, lived and breathed the public reading of Scripture in Greek, as completely irrelevant seems somewhat misguided. Furthermore, West, on the very page that you cite has a footnote that states, “In the case of the Homeric poems, however, such decisions will have been made by men familiar with the sound of the verse as preserved by generations of reciters, and mistakes are much rarer than has sometimes been thought. See Glotta 44,1967, 135-6.” If that was the case for Homeric verse, then how much more for the New Testament? Is that footnote about the accents introduced by scribes of the Byzantine period, or about something else? The entire passage is discussing editorial decisions on classical texts more generally. I have not read the book as a whole, as I only looked it up in order to check the citation that John pointed out. The reason John mentioned those pages is because West states, on several topics, (including word division, orthography, punctuation, and, of course, accents), that the modern editor is free to disregard the manuscript evidence on such matters if there is a good reason to do so. The reason I mentioned the footnote isn't because I think it is particularly relevant to the subject matter at hand but because even West acknowledges that, while such matters may generally be adapted as the modern editor sees fit, certain popular texts (such as the Homeric Poems) have a more accurate transmission of even such details than is generally recognized. Since unaccented indefinite τις equally appears within the same MSS (e.g. 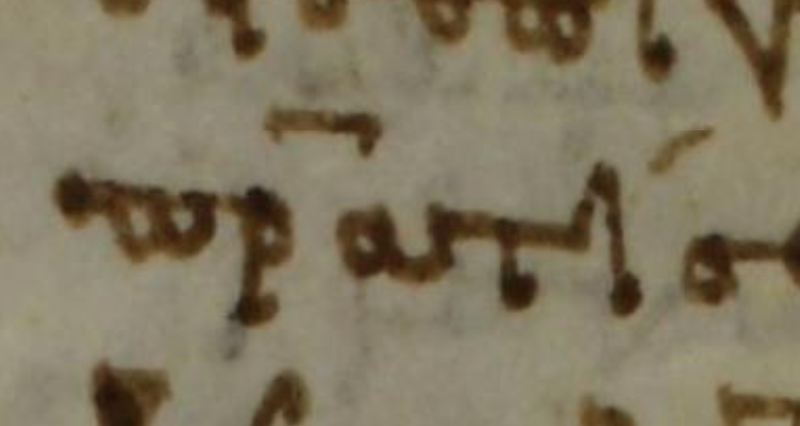 B/03 at Mt 21:3), would you perhaps suggest some sort of "rule" that could be applied regarding such scribal accentuation or non-accentuation of indefinite τις, or is something else involved? Also, what then to do, for example, in B/03 when a few pages later at Mt 16:24 one finds the indefinite τις without accent but with a diaeresis instead (τϊς)? Is there really rhyme or reason in such instances? I though we had already learned from the IOUNIAN fiasco not to fabricate accents. Where will this end? I need to do more work on the diaeresis (seen in Erasmus above). There is much inconsistency in places, but still and underlying tendency for an accent to appear when the pronoun is more prominent. For instance, if the pronoun precedes the noun it modifies my impression is that it received more prosodic prominence. In Mt 12.19 οὐδὲ ἀκούσει τις ἐν ταῖς πλατείαις τὴν φωνὴν αὐτοῦ the pronoun in also accented in B/03 and other mss. Are we, then, to interpret the clause as “nor will anyone hear his voice in the streets”? That seems to be taking us some distance from Isa 42.2. It seems to me helpful to recognize that indefinite τις can be emphasized, but I wonder how far we can trust the mss to reproduce this emphasis or lack of it correctly. I think this makes us ask, however, what the purpose of an edited critical text is? When I was reading this post (which was very interesting to read, btw, thanks for taking the time to post Peter) one of the first things I noticed was how hard it is for me to read the script of the later minuscules. Of course, that's because I don't spend a lot of time reading those mss. But I thought "man, i'm sure glad the critical texts are printed in a standardised, easy-to-read font." Why do the editors do that? Why do they set aside all the distinctive ms hands and present a standard, idealised script that, arguably, doesn't exist anywhere in reality? Well, because presenting a clear, understandable text aligns with their goals as editors, while duplicating old writing styles does not. I'd like to put some more thought into the proper goals of a critical text, but i'd bet my formulation would have something to do with providing a text for interpretation. Writing styles do not affect interpretation, so there is no need to preserve them in a critical text. Even more, since most reader would, like me, find it more difficult to read those old styles, preserving them would actually run counter to the goals of a critical text. You can see then why they would convert the actual writing of the mss into a standardised script. So what about these accents then? I wouldn't be dogmatic about it, but my first thought is that they are probably closer to the old writing styles than they are to anything substantively important to the goals of a critical text. By a large they do not affect the meaning, so like writing styles, they do not contribute to the goals of the critical text. And also like writing styles, i'd suggest their proliferation would make the text less accessible to most readers, and thereby detract from the goals. Many students today never even learn accents at all. I know my first year text, Wenham, didn't cover them at all, dismissively saying they weren't required. My teachers discouraged me from spending time learning them, saying it would be a waste to invest so much time in something that would pay such little dividends for exegesis. It wasn't till my doctoral work that I finally had to go back and do remedial work. But since then i've probably forgotten much of what I learned, as my daily work doesn't seem to require much interaction with accents, and accents, it turns out, are not like bicycles: if you don't us it, you will lose it! Bottom line, and would wager that the average reader today is probably, in regard to accents, more like me than Peter. Complicating the accent game now will just make the text less accessible to those readers. Is the accent rule for tis and ti technically wrong? At very least i'd concede that the reality is probably not as simple and straightforward as the rule suggests. But I don't think that necessarily means we should change that. As I think the writing styles thing shows, we already accept a degree of idealised simplification for the sake of accessibility.